Consisting of premium Italian tobacco leaves in its blend, CAO Italia hand-rolled premium cigars are individually crafted starting with a rich Colorado Maduro wrapper, infused with a rich-tasting Honduran Habano seed binder, and fillers from Nicaragua and Peru. CAO Italia premium cigars are a medium to full-bodied smoke that is robust offering a unique and earthy sweetness yet remarkably smooth. Cigar connoisseurs who love a deep, rich and rewarding smoking experience will enjoy CAO Italia premium cigars. Stock up your humidors with these masterpiece hand-rolled cigars. Smokers Discounts has made it easy and affordable to buy premium cigars online. 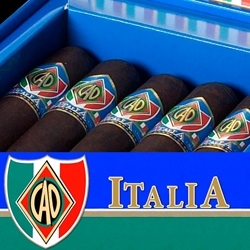 We can ship CAO Italia cigars right to your front doorstep. Try the one of the varieties of sizes and flavors listed below at our online cigar store. Each of these styles are in stock today at a low discount price! Call us for more details!